Bob and I paid a visit one spring to the Lower Reesor Pond in north Toronto , Ontario, and had purposely allotted a large chunk of time in order that we might pay some well deserved attention to that special habitat. 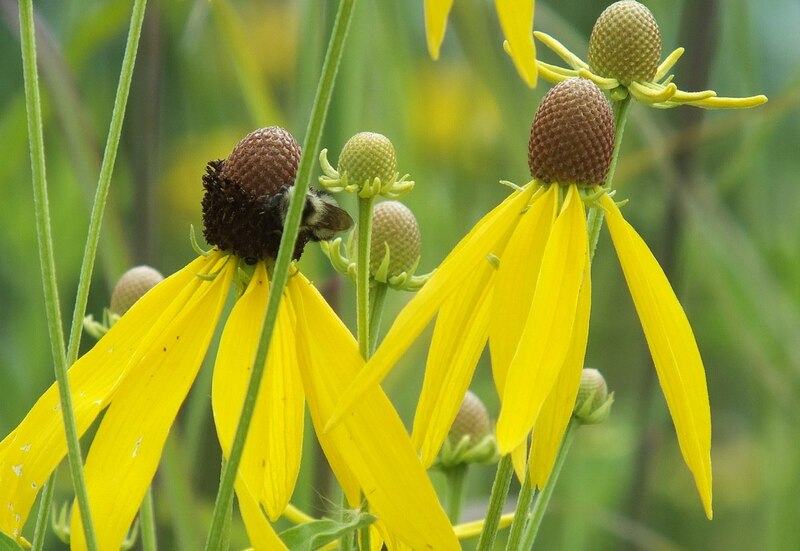 Through reports provided by other visitors, we learned that some less common wildflowers and plants have gained foothold in the area surrounding the pond, and sure enough, we uncovered several groupings of Wild Coneflowers. 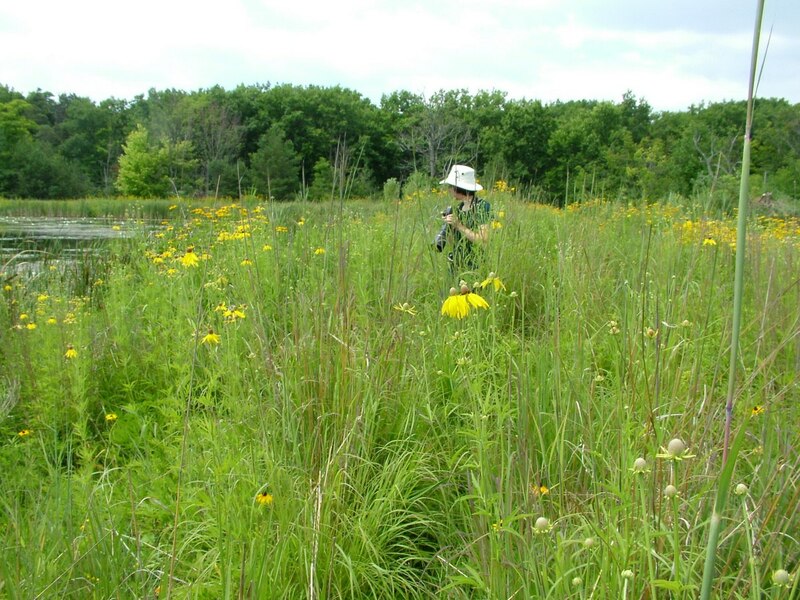 I have lived my whole life in Central and South Central Ontario, and even as a child, spent endless days wading through long grasses in overgrown fields and exploring long-deserted meadows. 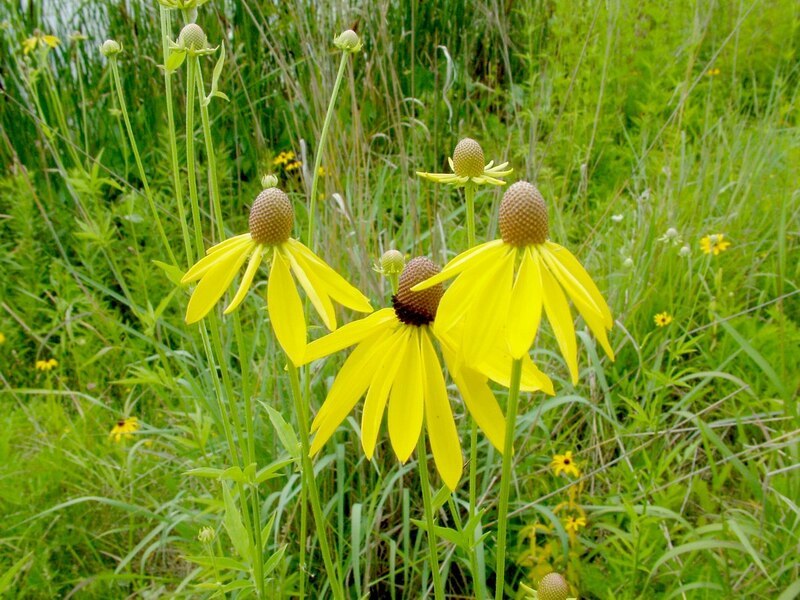 Given that and the fact that Bob and I explore an endless variety of protected lands across the province, neither of us had ever seen this species of wild coneflowers before. Lower Reesor Pond is a relatively new wetland habitat that was completed in 2008. From what I could learn on the internet, apparently there is no creek or river that supplies water to the pond, but through careful planning and man-made structures, any water that accumulates there is held back to create the wetland. 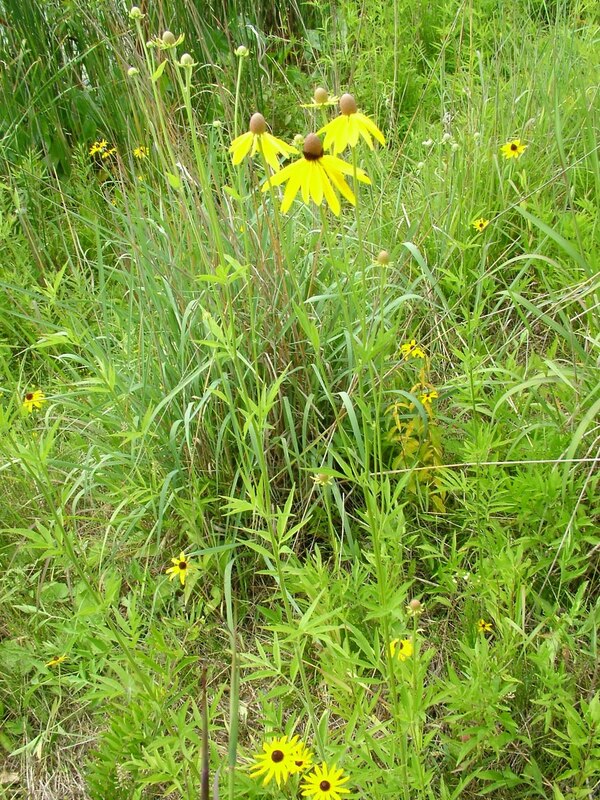 A berm runs along the west and north side of the pond, and the whole area there and around the pond has become naturalized. It appeared to Bob and me that scores of trees and bushes had been planted in the field surrounding the pond. I was absorbed in observing the myriad bees on and around the plethora of Queen Anne’s Lace, Jerusalem Artichokes and Black-eyed Susans so at first I overlooked these stunning wildflowers. It was the wild coneflowers bulbous centres that finally drew my attention to their uniqueness. 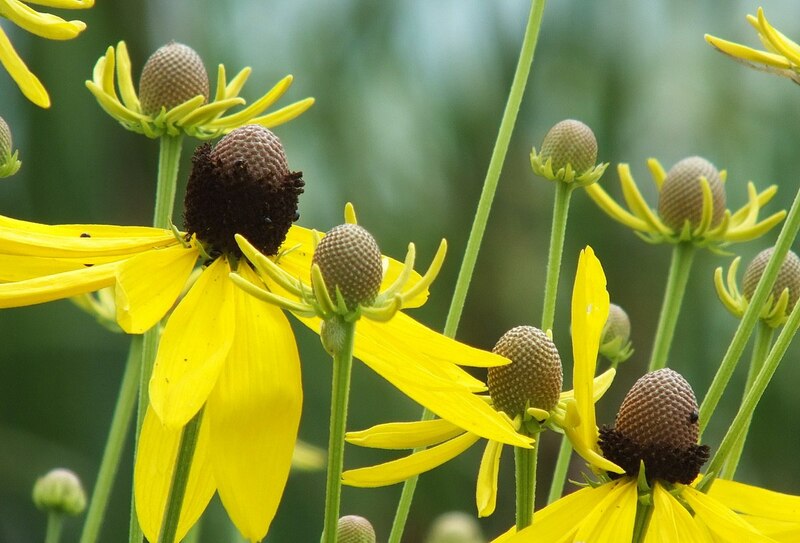 Before, when I thought of Coneflowers, it was always the purple variety that came to mind…those tall, purple daisy-like flowers that are popular with home gardeners. I have some in my own flowerbed. I did not realize that these hardy, drought tolerant perennials are native to North America. Those found growing in the wild are either purple or yellow; quite clearly those that we came across had collars of long yellow petals. 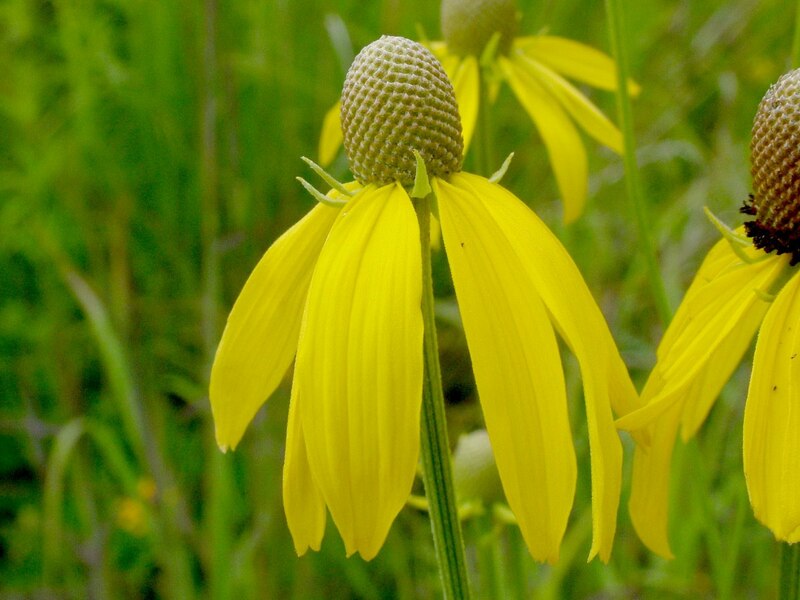 Wild Yellow Coneflowers are native to both tallgrass prairie and savannah habitats so they are well-suited to dry conditions and thrive in well-drained soil. On the berms bordering Lower Reesor Pond, the conditions are perfect because the elevated land provides excellent drainage…runoff would efficiently flow into the pond to help maintain the water level. 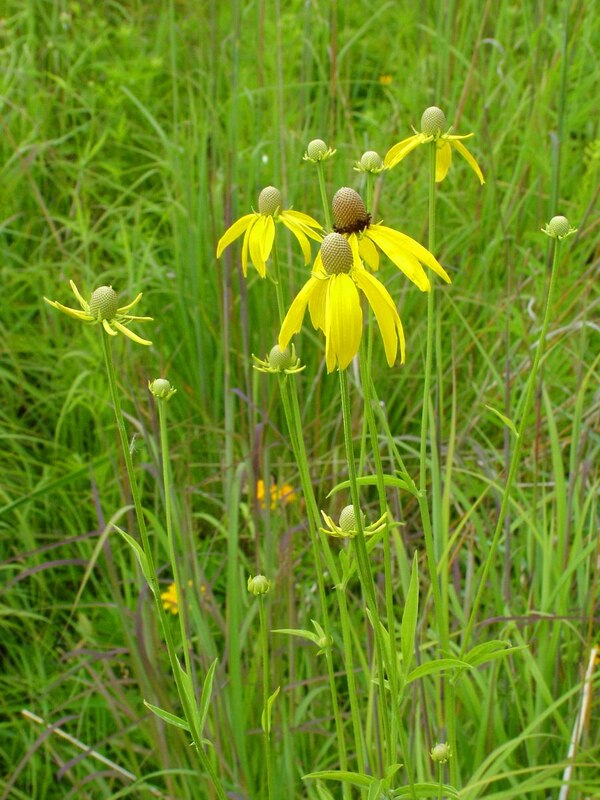 These quintessential prairie plants are long-blooming brilliant flowers that have daisy-like blooms with raised centres. The droopy delicate yellow rays contrast the stiff, rough leaves. The cone-shaped centres of these summer bloomers gradually change from green to either dark purple or brown resulting in a striking silhouette amongst other wildflowers. We are lucky that this local wetland supports these native plants because they, in turn, support butterflies, bees and finches. I could look at these coneflowers all day long.They are stunning,perfectly formed in every way.Thank-you so much for introducing me to them. thanks, Hazel. It is nice to hear from you again. Yes, we found the flowers remarkable. It is too bad that the vast prairie habitat that used to exist in central Ontario has been so eaten up by residential development and urban centres. Still, small pockets exist that provide us with rare glimpses of the plant life that used to thrive across a much broader area of the province.